Happy International Women's Day! I hope you all took some time today to appreciate and celebrate your unique skills, strengths, beauty and journey. Art doesn’t have to be big. It can be quick and small and still make an impact. The March 7 prompt for Artful March is “Miniature” and my interpretation is a small piece of art via an artist trading card (ATC). If you’re not familiar with ATCs, they are 2.5 x 3.5” works of art in any medium meant to be signed and traded with other artists. There is so much inspiration on Pinterest for ATCs, ranging from elaborate miniature drawings and paintings to simple but graphic works. This piece uses a mat board cut to 2.5 x 3.5” and I used a ripped piece of paper as a mask to ink the background in Archival Ink. I used the same color ink to stamp a flourish to represent movement. The butterfly is from the Tim Holtz Stampers Anonymous “Flutter” stamp set and I stamped it on mixed media paper and colored it with Prismacolor colored pencils and cut it out. 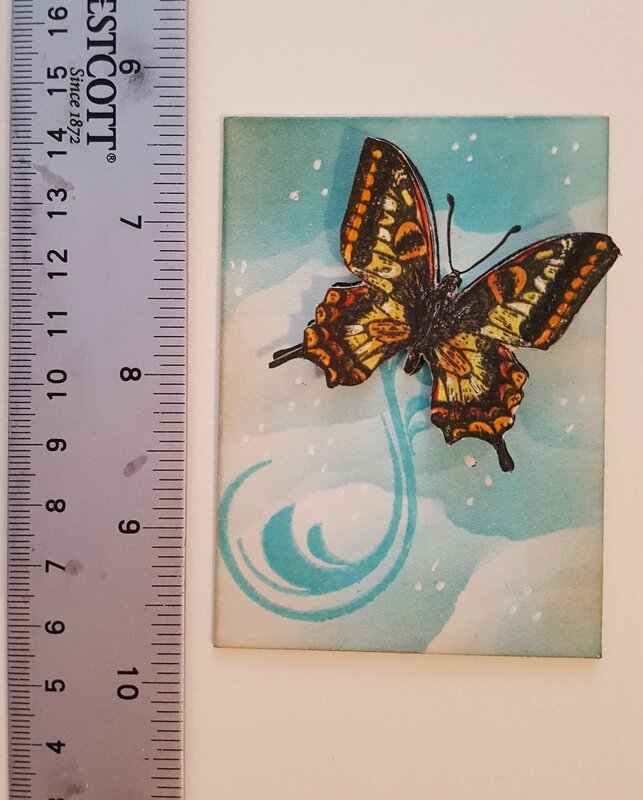 I stamped the same butterfly onto the ATC background in black ink then adhered my colored butterfly over the top of it with foam dots to give dimension. I used my trusted white gel pen for some finishing touches. I’d love to start an ATC-trading group through Free Heart at NOCO Crop Stop if there is interest. Be sure to email us at freeheartllc@gmail.com if that is something you would like to participate in. 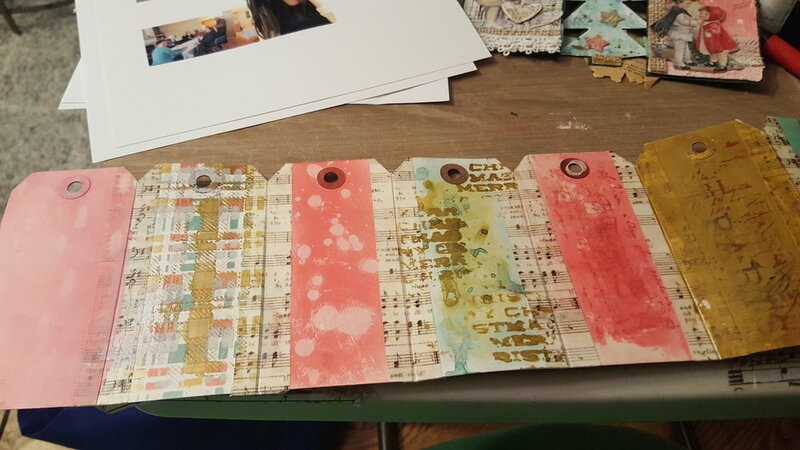 And I have a goal to do a future art challenge (Similar to Artful March) where we do ATC’s and post them every day. Stay tuned for that. I started with an ombre watercolor background using my Sakura Koi Pocket Field Sketch Box. I let it dry completely and wrote the sentiment with brush markers. Talk about finding the calm in the chaos! 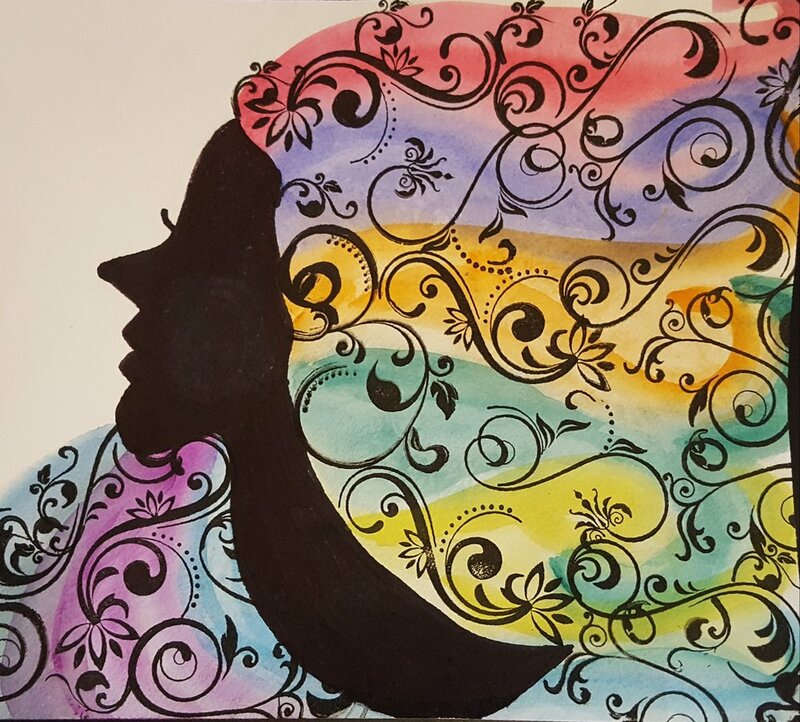 The March 5 Artful March prompt is "Personality" and my interpretation is a personality trait I wish I had more of: seeking the good in all things. Some of this piece might look familiar. I actually used the watercolor painting I did on Day 2. I really liked the painting, but it felt a little disjointed to me, so I deconstructed it, and cut up the flowers. 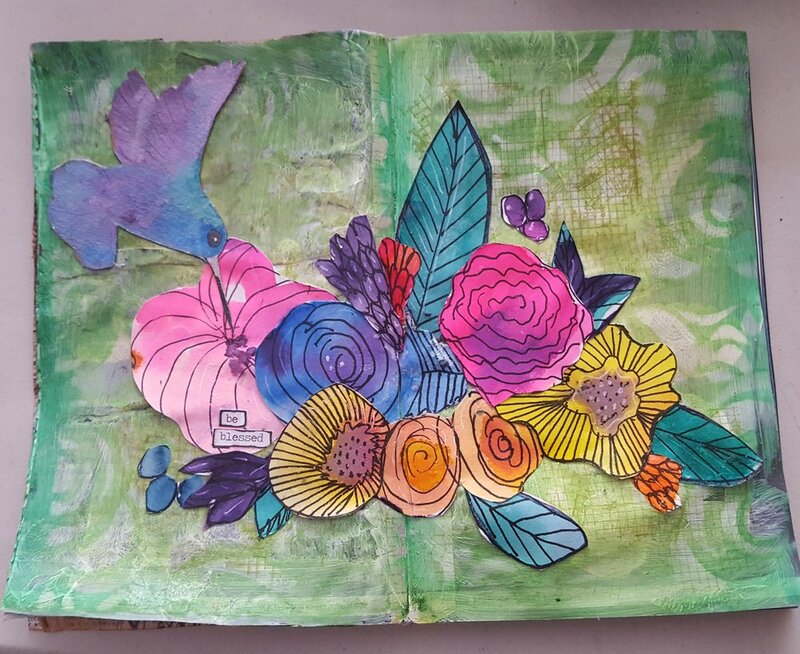 I looked through my stash of ephemera I've already created and found a hummingbird I painted several years ago and never used in my journal. It was a match made in heaven for these flowers. I used my little upcycled journal and covered the spread with gesso and let it dry. I added color to the background with Faber Castell Gelatos, then removed some of the color with a baby wipe and a stencil. I did some random stamping with a green Archival ink to give tone-on-tone texture. I glued my flowers and the humming bird to the background with gel medium and sealed the entire page with a light coat of same gel medium and let it dry. Once it was completely dry, I went over the flowers with Faber Castell Big Brush markers to add vibrancy and shadows. The pens are India ink, which is permanent when dry; but when wet you can move the ink around with your finger or a baby wipe. The India ink brightened the page and the shadows added so much dimension. I finished the page off with some highlights from my white gel pen, and a stamped title that I outlined in the white pen. If you're creating this month, please share it with us by using the hashtags #freeheartart and #artfulmarch on Facebook and Instagram, or email us at freeheartllc@gmail.com. You might win some creative products! 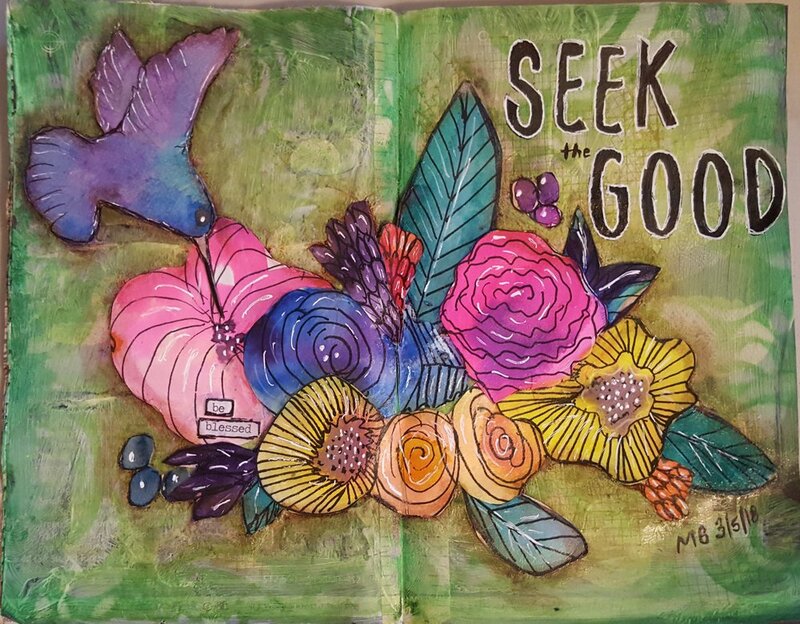 May we all seek the good. 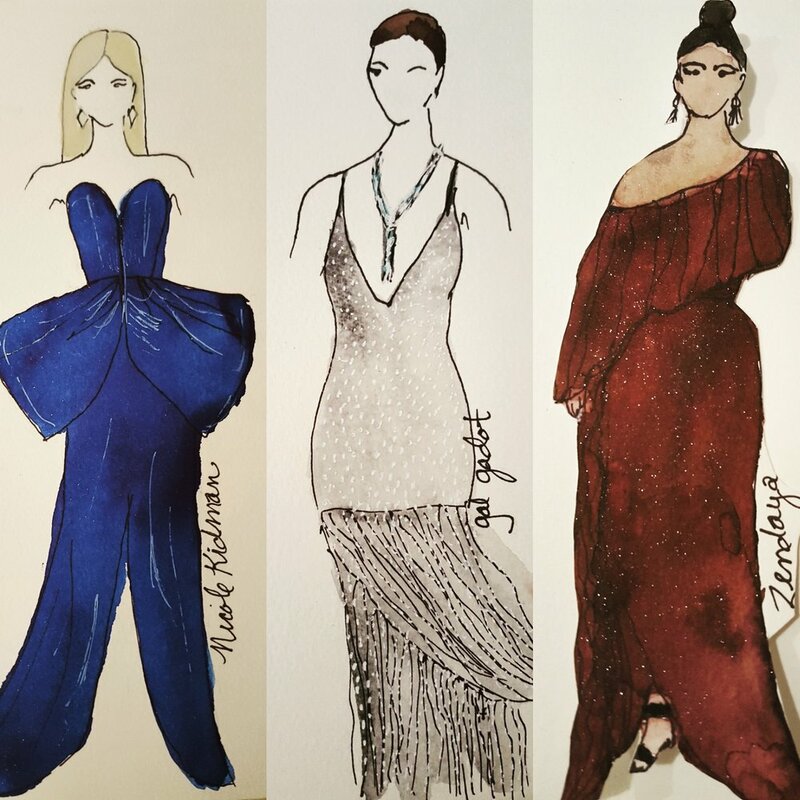 I enjoyed watching the Oscar’s Sunday night and sketching out some of my favorite red carpet looks. I found myself drawn to a variety of different dresses, but I think my favorites were Nicole Kidman’s bow-front gown in its stunning deep blue color, Gal Gadot’s flapper dress with so much sparkle, Zendaya’s chocolate brown gown with its drape over one shoulder, and the beautifully romantic Emma Blunt dress in soft blue. I made note of the dresses I loved first, and found still photos of them online later to sketch from. On Sunday evening I sketched onto watercolor paper and on Monday evening I inked in my lines and added color using watercolors and watercolor inks. With quick sketches like this you can continue to fine-tune them using colored pencils and other mediums. I didn’t use colored pencils this time, but I may do so if I add these to an art journal page. I kept everything quick and loose, concentrating on the gowns themselves, and added white gel pen for highlights. That worked well for the sequins on Gal’s dress, and the shine of Nicole’s gown. Did you watch the Oscars? What did you think of the gowns? Did your favorite actors and movies win? I Want You To Be Happy . . .
One thing that makes me really happy is color -- rich, vibrant color. So when I finally got a chance to play with the new Brea Reese watercolor inks, I was down-right joyful. We have these in stock at NOCO Crop Stop if you want to give them a try yourself, both the watercolor ink and the ultra shimmery glitter ink. I used some of both for this project, although the camera doesn't do the glitter ink justice. The Brea Reese youtube channel has some great video's for beginners, showing how to use these inks. I put a couple drops of some of the colors into a ceramic pallet, then just used them like regular watercolors. 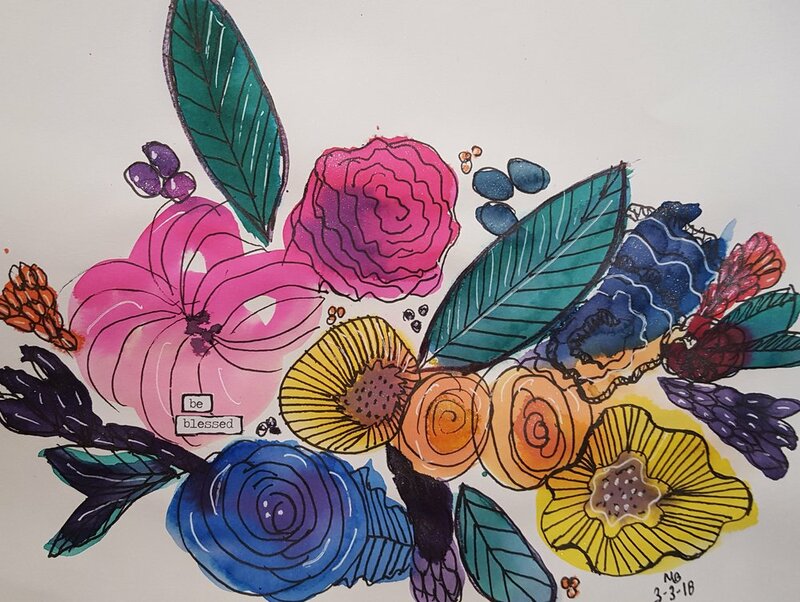 First I loosely drew flowers in water with a watercolor brush, and then I dropped color into the water on the paper and let it do its thing. I used mixed-media paper, just to see how the water and color would take. I loved my end results, but I am going to try watercolor paper next. After I let the inks dry, I doodled over them with a black Sharpie fine-liner pen. Sharpie works well if you're going to be using wet mediums because Sharpie ink is waterproof once dry and it won't smear or reconstitute. I added some random highlights with a white Uniball Signo broad gel pen, and added a "Be Blessed" quote using the Tim Holtz Ideology Chit Chat stickers. I drew around the quote with the Sharpie. The colors are gorgeous, but the sharpie and white highlights pull it all together. I was so inspired by the cropped sections of this piece that I decided to use the painting as a base for the Day 2 prompt, World Day of Prayer. You can see that blog post right before this one. I hope you are able to take some time for yourself today to be creative. If you are, please remember to share your work and tag it #artfulmarch and #freeheartart. And I truly do want you to be happy! Things don't always work out the way we plan; and with art, that's perfectly fine. The key to creating for fun is to not set limits on yourself. No deadlines. No rules. So I did things a little backwards for Day 2 and 3 of Artful March. I am going to try to follow the prompts, but some days I may stray from them, and you certainly can too. They're there as a tool to help jump start creativity, and there are no hard and fast rules. World Day of Prayer, which was March 2, was founded by Christian women across the world to create a global network, or sisterhood, of service and prayer for our communities and our planet. I knew that for my interpretation of the World Day of Prayer prompt I wanted to capture something feminine that showed connection. My thought immediately went to a paper doll chain, like the kind that we learned to create as children. So I practiced a little with colored printer paper, but I decided I wanted something even more colorful. That is when I decided to use another project I was working on for Day 3 as a base for my paper dolls. You'll see more about the Day 3 project based on the prompt "I want you to be happy" in the next blog post. I made a copy of the project using my personal printer and plain white copy paper. I actually made a copy in black and white and one in color. I figure I can use them both in future projects. I then cut the color image in half lengthwise and folded it accordion style. Then I sketched my girl onto the folded edge, and cut around her. The result is a beautifully colorful chain paper doll, with some extra pieces I can use in other projects. I love how the paper dolls came out and I will use them in a future art journal page. Remember, for Artful March you don't have to create a finished project every day. The goal is just to do something artsy or creative daily to help build creative habits. And the results can be finished projects if you want them to be, or just steps toward future finished projects. For now, I am quite pleased with my pretty paper dolls. They make me happy! Happy first day of March and the start of Artful March! Today's prompt was "In like a lion," and my interpretation reflected the stressful day I had. We all have those days, but sitting down for a few hours to just be free to create helped to relax me and melt some of the stress away. Being creative can be very therapeutic! I started by doing a little upcycling and I turned a small advertisement booklet into a little journal. It was junk mail I normally would have put into the recycle bin, but I put it to use instead. I taped all the pages with masking tape down the center of the spread. This will help protect the pages as I start to add gesso and paints, and keep the mediums from oozing down into other pages. My masking tape has a tape-measure design, but that doesn't matter; it will get covered up. After taping, the pages are ready to take gesso, paint or collage mediums. I covered the first two pages in gesso, and while they dried, I drew the lion on some waxless deli paper, which is a little like tissue paper. After drawing him in pencil, I then went over him in ink using a Sharpie fine liner and a regular Sharpie. I tried to keep the drawing loose and simple and used a Google image as a reference. Next, using gel medium I adhered some old dictionary pages over the gesso in the new journal. 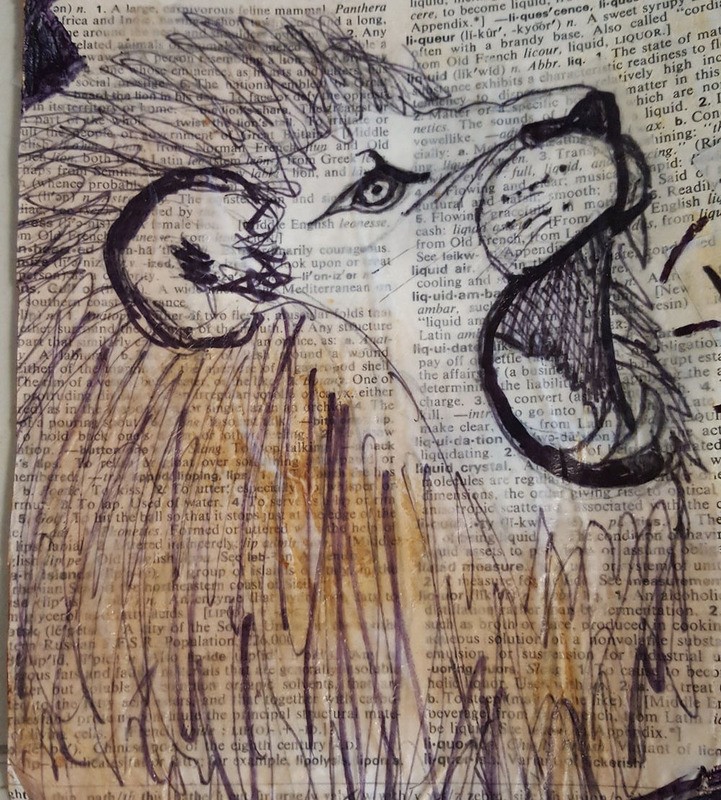 I then tore the paper away from around the lion image and adhered just the image over the dictionary paper. Since the deli paper is semi-transparent, the words of the dictionary show through the drawing and I love the way that looks. It also means that the torn edges of the image faded away into the background and it almost looks as if I drew the lion directly onto the dictionary paper. I then colored over the dictionary paper and the lion using Ranger Distress Inks in vintage photo and scattered straw and an ink blending tool. Using a Sharpie, I wrote onto more deli paper some of the things that were stressing me out today, and I cut out the words and glued them to the page so that they looked like they were the lion's roar. I then added a black border around the page, and the March 1 title. I finished off by splattering a little gesso onto the page, then painting in the March 1 with white gesso. The page was fun to create! Tomorrow's prompt is "World Day of Prayer." What will you create using that prompt, or a prompt of your own? Remember to share your Artful March projects on Facebook and Instagram using the hash tags #artfulmarch and #freeheartart. If you don't feel comfortable posting your work publicly, feel free to email us a photo at freeheartllc@gmail.com. We can't wait to see what you've been working on! Let's have a very ARTFUL March! 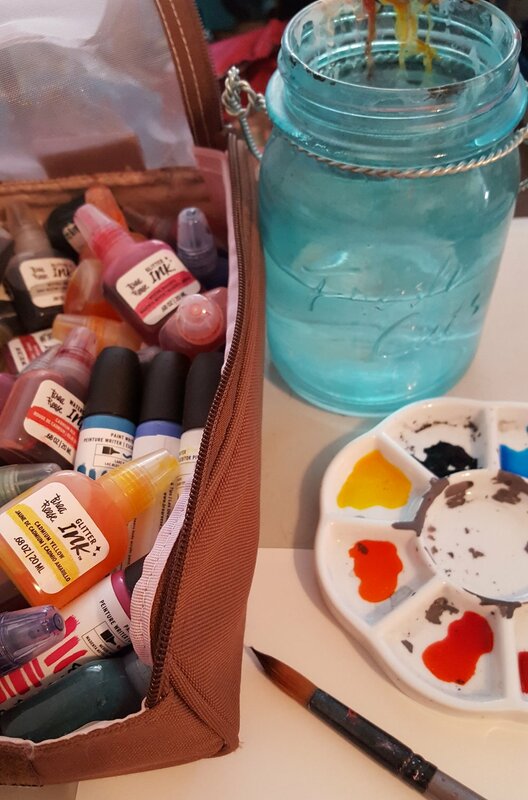 Remember to post your artful work on Facebook or Instagram and use the hashtags #freeheartart and #artfulmarch to be included in a drawing for some great artful products! 2018 is a great year to be creative and at Free Heart we're gearing up for a very Artful March! In anticipation for some of the fun things we have planned, we thought you might enjoy a little creative inspiration. These were all daily illustrations we did for Inktober 2017. We hope you enjoy and that you make something beautiful today! Thank you to all the ladies who stopped by NOCO Crop Stop last weekend for our Grand Opening! It's been five wonderful months since we opened up our shop and we are so thankful for all of the support and love we receive from all of YOU! We hope that you enjoy creating as much as we do. We will do our best to share our love of all things creative with new products and techniques. Want to play with some cool art products and make beautiful projects? We do! And we’ll show you how. Free Heart has officially opened for business and we’ve been busy meeting new people, playing with paint, and setting up shop at our new home in Windsor, the NoCo Crop Stop! Free Heart's little corner of Heaven at NoCo Crop Stop. One of Free Heart's first official classes at NoCo Crop Stop - altered Prima birdcage. So cute! And how cute are Nina and Joy with Tanya? Months ago, when Tanya and I were just in the planning stages of Free Heart, we knew a retail component to the business was something we wanted to work towards, but we had it in or long-term plans. And then in early 2016 Kim Racine and Linda Gernert, two of the business-owners of the NoCo cooperative, asked us if we would be interested in sharing a retail space in their beautiful little shop. Tanya had already been teaching classes periodically at NoCo for several months on her own, and she had cropped there many times in the past, so she knew what an amazing opportunity we had been given. We would have the perfect space to teach classes, an inspiring creative space from which to work, and a little corner of heaven to set up shop! We just knew we couldn’t pass it up so we fast-tracked the retail plan and jumped on board. We officially joined the cooperative on April 1, and we couldn't be more excited. NoCo Crop Stop has such a relaxing, creative vibe. We're conveniently located right off of I-25 at the Windsor exit. The 1000 square-foot cropping room seats 30 to 35 people and has such a relaxing, creative vibe. You can walk-in and crop, or make private group reservations. There are also sponsored crop events and classes throughout the month with the cooperative's vendors on site to satisfy all your scrap-booking and mixed-media needs. And these ladies are creative geniuses. There's Angie of Capture Kits, Kim of Memories Unlimited, Linda of Crop-A-Latte and Tanya and yours truly of Free Heart! We hope you can come check us out soon. In the meantime, check out the NoCo website and Facebook pages for more information. See you soon, and happy creating!